they are both beautiful pieces.....strange that you were talking of of the shipwrecks and widows...as I just listed a card in my shop that has the same theme!!! You artwork is stunning. Yes its hard watching the clock whilst working - time seems to run away. By the way (couldn't find your email) the image on the lock I did is of a lady called Esther - a part of her story is a few posts back on my blog. Thanks for stopping by and commenting - much appreciated. I empathise with a lot of the art/soul searching thing - it can only add to the lovely atmosphere of your work (three cheers for melancholy!) and will I'm sure help your thoughts as it all comes out in your art. Gillian! Lovely work as usual, the painting is wonderful!!! You are amazing in pursuing your 'weekly small change' so diligently... I need to follow example. My problem with 'time' is that as a mother and wife, so much of my 'time' revolves around others - perhaps I should try getting up at 6:20 too... Yes, please do show us your childhood photos and 'sweetness and light', with the world so troubled these days we need as much 'loveliness' as we can get! With that in mind, I'll be here tomorrow at 11:00 PST!!! HUGS! I can't tell you how inspiring your work is! 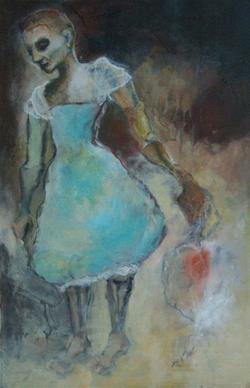 I love to visit your blog, gaze into your paintings and let my mind carry me as far as it will go. a beautiful post. 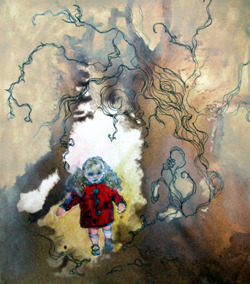 i love your analogy of the forest, and the image of the child you in the red coat is perfectly, ethereally haunting. red coats and the forest are one of my obsessions in this crazy life, indeed! the progress work is a dream, like something half glimpsed in the fraction of a second, yet memorised for eternity.